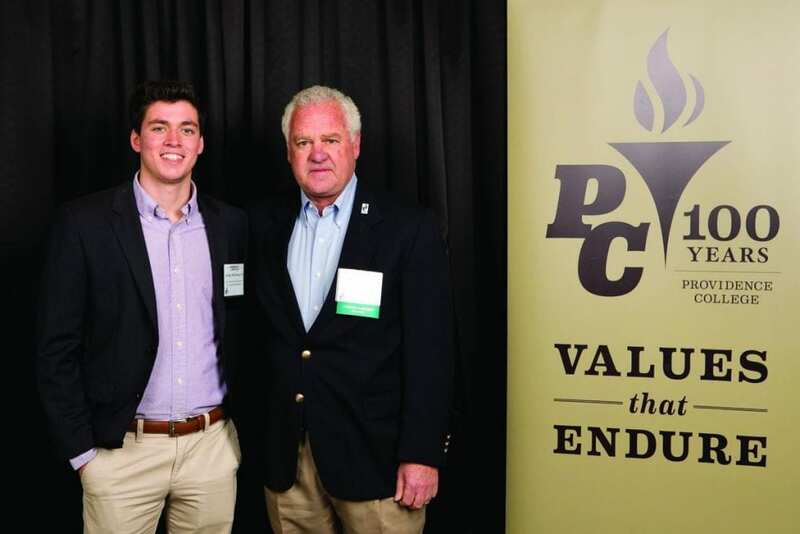 To express his gratitude to Providence College, Everett Gabriel ’71 & ’77G established a scholarship to help students like him. 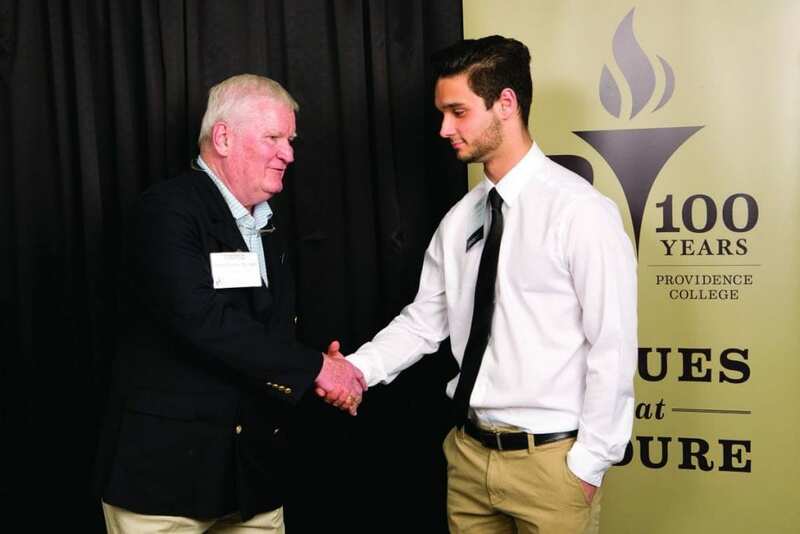 Then he went further and became a mentor to the recipient, Joseph Padavano ’17. 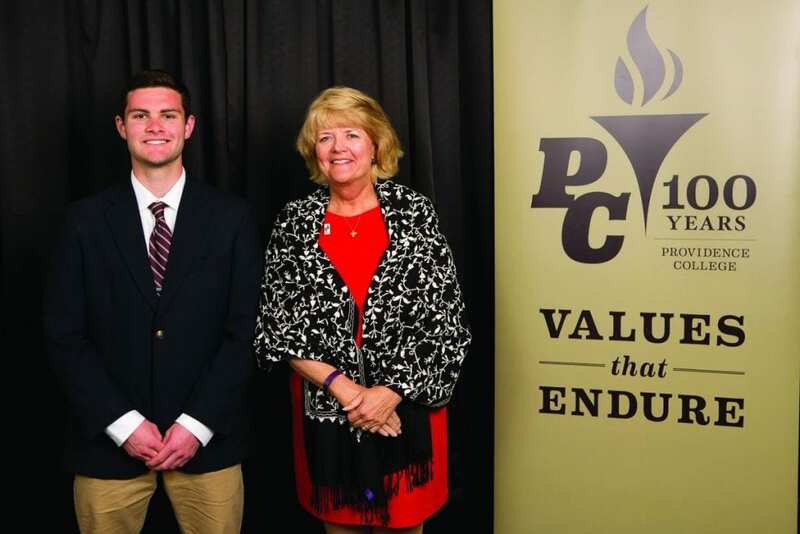 Through Gabriel, Padavano received not only scholarship aid, but career assistance and internships that led to a full-time job after graduation. He got advice about how to navigate the world after the death of his father. And when it was time to buy a house, Gabriel put him in touch with a real estate agent, lender, and insurance agent. Gabriel arrived at PC in 1967, a year after his father, a baker who also was named Everett, died unexpectedly. 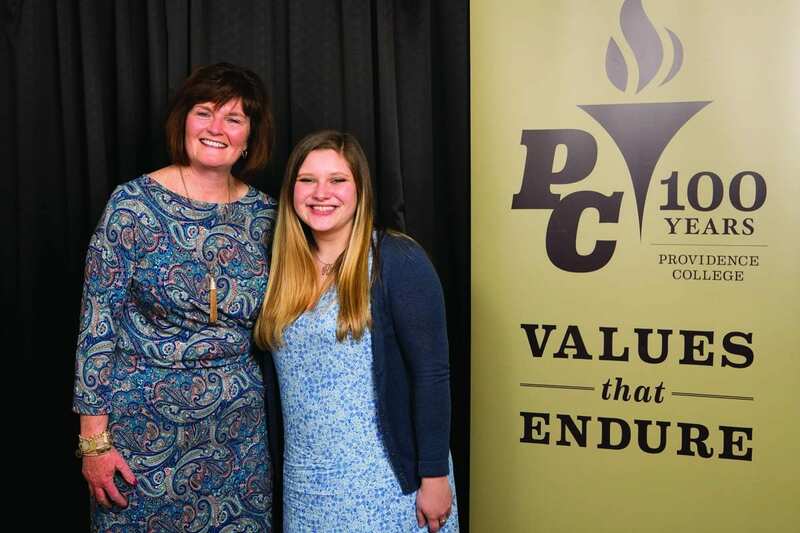 An only child, Gabriel had considered colleges far from home, but when his mother began attending support group meetings at PC with other women who had lost their husbands, the College seemed a natural fit. He commuted from Cranston and studied accountancy. In 1969, Gabriel was sitting in the Alumni Hall cafeteria for an event men of his generation will remember — the national broadcast of the draft lottery. It determined the order in which men born between 1944 and 1950 would report for military service in Vietnam. Full-time students were exempt, but failing a class put one’s student status in jeopardy. The numbers ranged from 001 to 365. Gabriel’s was low — 023. He would be among the first to be drafted. He found it hard to concentrate after that. His grades plummeted; he was ordered to meet with the dean. The College allowed him to attend summer school and remain a full-time student. After graduation, Gabriel served with the National Guard. Gabriel dreamed about establishing a scholarship to benefit young people like himself. Finally, in 2007, after helping his four godchildren attend college, he approached his classmate, Bill O’Neil ’71, who worked in PC’s Office of Institutional Advancement, and asked for help in developing a plan to make the scholarship a reality. Gabriel began raising money in earnest for his scholarship. He wanted to honor his family — not just his father, but also his mother, a clerk-typist for the state, who sacrificed so he could attend school. Through the years, while working in corporate tax positions in Rhode Island and Massachusetts, and earning an MBA from PC and a master’s degree in taxation from Bryant University, Gabriel maintained ties with PC’s National Alumni Association. He allowed PC students to shadow him on the job. In 2009, the Greater Providence chapter of the alumni association, known as the Mal Brown Club, gave him its Dr. William A. McDonnell Award for dedication to the College. When his mother and aunt died, he contributed proceeds from their estates. Friends and cousins helped. Gilbane made matching gifts. 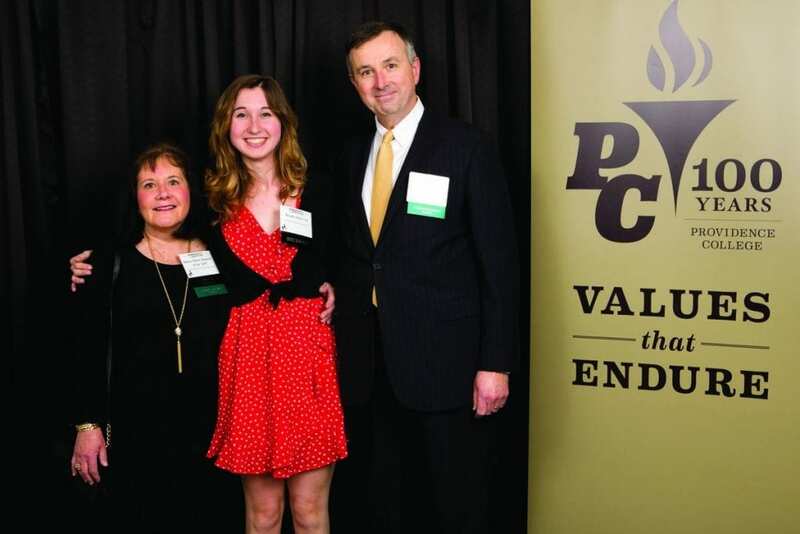 Finally, in 2010, the Gabriel Family Scholarship — currently $5,800 a year for a student with financial need, with a preference for an accountancy or business major who has lost a parent or has a disabled parent — was awarded for the first time. There have been four recipients so far. Gabriel made it a point to reach out to each of them to offer his help. 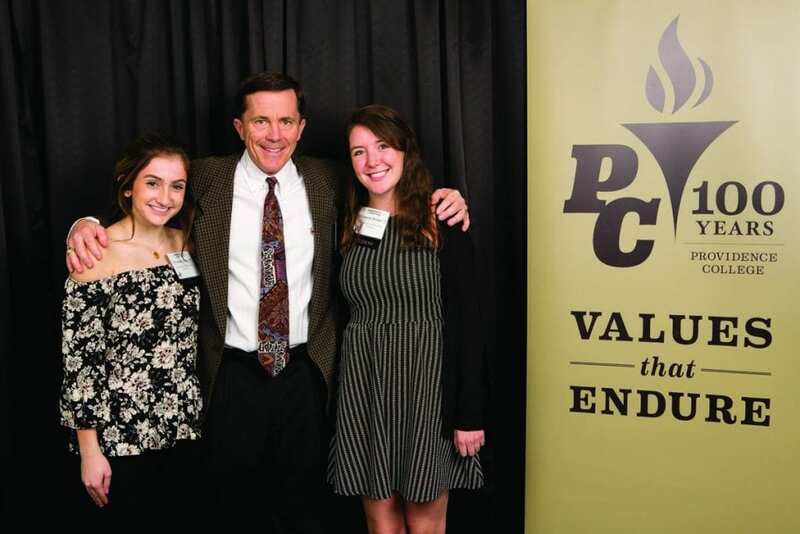 In 2015, at PC’s annual dinner for scholarship donors and students, he met the third recipient — Padavano — and something clicked. 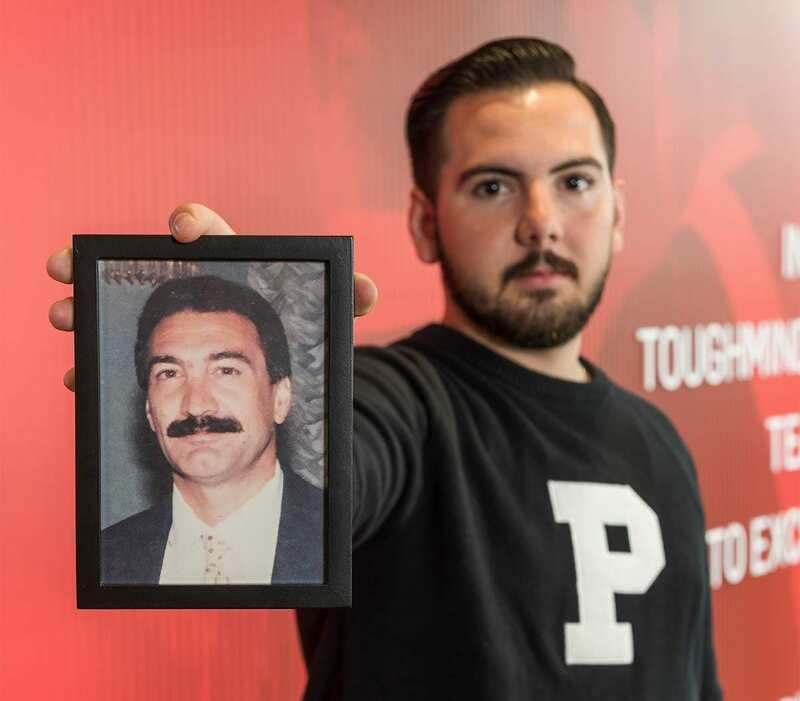 Joseph Padavano ’17 holds a photo of his father, Louis, who died in 2011. 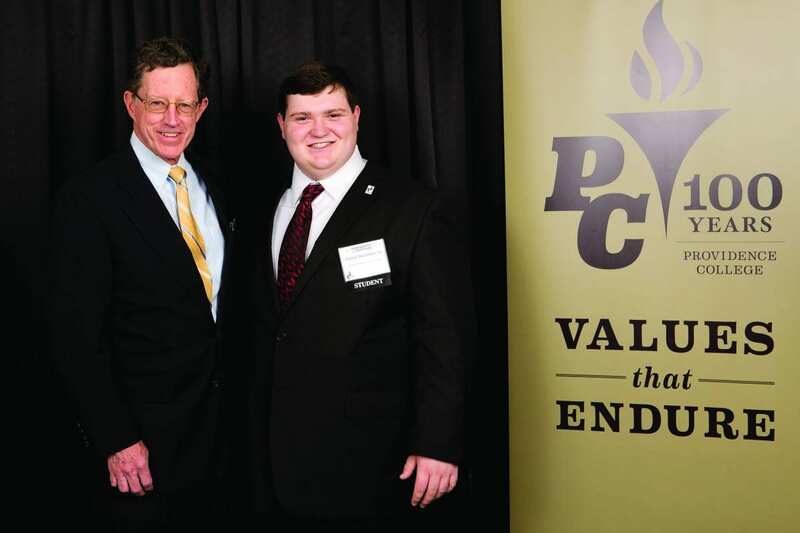 Padavano and Everett Gabriel ’71 & ’77G both lost their fathers while in high school. — Rev. Iriarte Andújar, O.P., PC’s associate dean of admission. The priest caught Padavano’s attention, too. So did PC’s Development of Western Civilization Program. 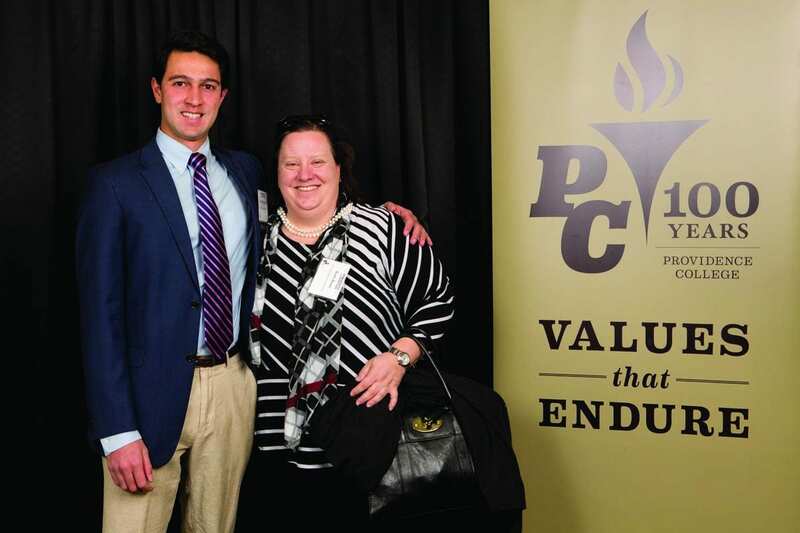 After the scholarship dinner in 2015, Padavano accepted an invitation to meet Gabriel at Gilbane. 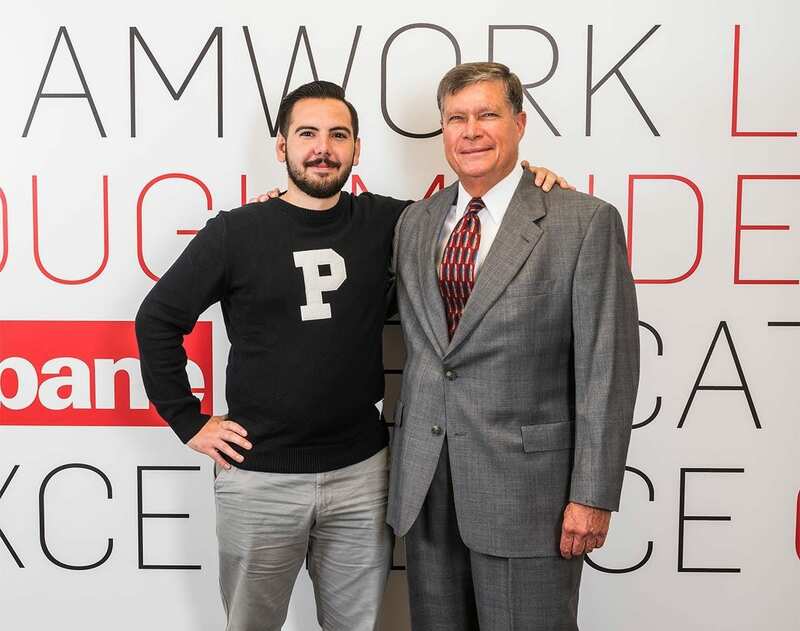 Joseph Padavano ’17 & Everett Gabriel ’71 & ’77G in Gabriel’s office at Gilbane headquarters in Providence. Padavano told Gabriel he was uncertain whether to pursue public accounting or private accounting. Gabriel arranged two paid internships so he could try both. 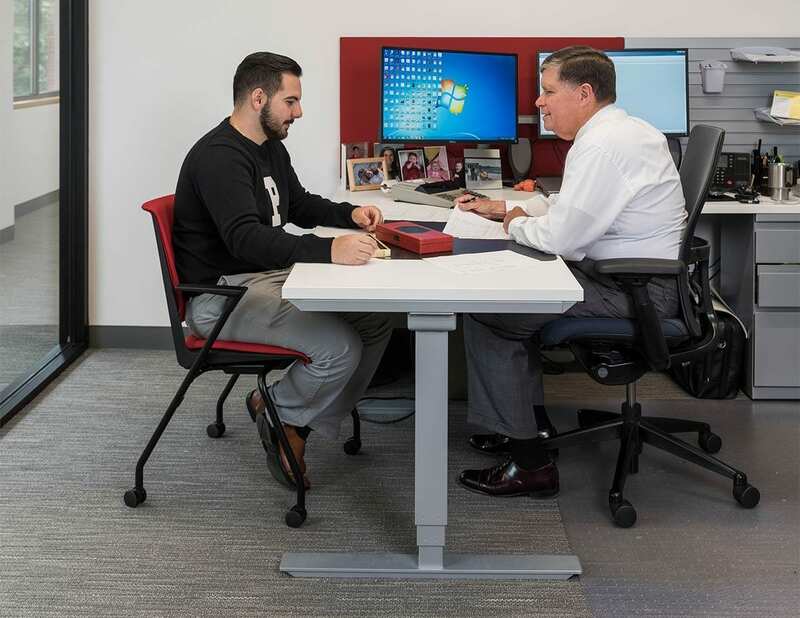 Padavano was a project accountant for Gilbane on the South Street Landing site in Providence. At Kahn Litwin Renza, also in Providence, he interned in the audit and tax departments, and KLR gave him a full-time job after graduation. During his senior year, as graduation approached, Padavano decided to use an inheritance from his grandmother to buy a house. “Team Gabriel” swung into action. Padavano, who is the youngest of five and who has a large, extended family of aunts, uncles, nieces, and nephews, now lives in Pawtucket with several housemates who were resident assistants with him at PC. Gabriel took them all to dinner to celebrate their graduation — and forwarded their résumés to his contacts.